Maybe it’s the fresh air, the woody scents, or the sounds of birds, rushing streams, and leaves in the wind. Whatever it is, food cooked and eaten outdoors is just supremely delicious and completely magical. You can toss a plain old burger on a campfire grill and it will morph into the most succulent, most flavorful, most chomp-worthy burger you’ve ever had each and every time. Stick a freshly-caught fish on a stick and hold it over an open fire and wow, you’ve just created a meal laudable enough for Michelin stars. ‘Tis true, so very true. So now, we’ve decided to take that marvelous base of delicious to a whole new level with crave-worthy camp creations that are going to have you firing up all year long. This Camping Cookbook is full of delicious, easy-to-prepare recipes that take you off the beaten grill path to all sorts of taste adventures. Here we want to connect you with true outdoor cooking. That means no pots and pans, just straight-up grilling over a fire pit or grill. Recipes range from delicious Blueberry Pork Belly to Chicken Bacon Tootsies and Ying and Yang Salmon to Spicy Kebobs. If you love seafood, you must try the Lime Fish Tacos and the wildly simple but wickedly delicious scallop recipe found in the seafood section – among other deliciousness, of course. We’ve even got a tantalizing easy dessert section that includes indulgences like Deconstructed Peach Cheesecake and Chocolate Rice Krispy Marshmallows. Yes, they are as superb as they sound. 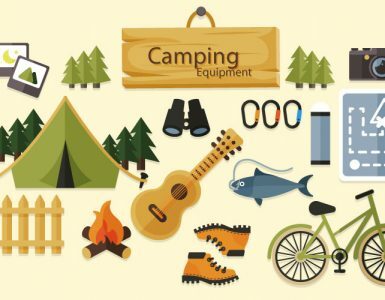 Camping is a time to relax and connect with friends and family while also reconnecting with nature, so the cooking part when f﻿﻿amily camping should be easy. 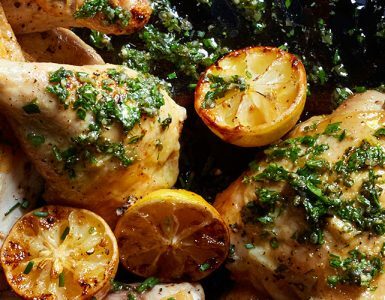 Popping food on the grill is a great way to get lovely layers of flavor without a lot of fuss, and the scent of such creations wafting through the air just adds a special kind of ambience –especially in the evening around an open fire. The recipes created for this book take the concept of simple outdoor grilling up a notch with simple twists to the average grilled dish. With a little spice and creativity you will be revamping your camp cooking style, and your fellow campers will love you for it. So get outdoors, get tasty, and get magical with your campfire creations this summer. Of course, there is nothing magical about getting sick after noshing on food that’s been tainted. Not only does it ruin your trip, but if you’re in the back country, it’s going to be awhile before you can get to a doctor. So, let’s eliminate the possibility of even coming close to contaminating your food by going over some simple precautions you can take that will ensure you have the best trip ever. Use a hard-shelled cooler instead of insulated bags for long camping trips. These guys are much better at keeping groceries cool and will ensure you get mileage out of the food you take. It is best to store your raw meats in their own cooler. In fact, it is not just best, it should be the rule. Use leak-proof containers or mason jars when you pack your food. If you’ve cooked something to take on your trip, cool it, and transport it cold to prevent bad bacteria from forming. It is important that you pack your foodstuffs correctly to ensure that they stay cold and don’t get contaminated. With that in mind, if for any reason you need to pack your raw meats and other foodstuffs together, pack your raw stuff on the bottom so there is no danger of contaminated liquids leaking over other food. Definitely pack a food thermometer so you can ensure your meats are cooked all the way through. Please see the internal temperature cooking charts in the appendix at the end of the book. Make sure you wash your hands with soap and water after handling raw meat. Remember to wash any utensils that contact with raw meat as well to prevent cross-contamination. Make sure you don’t have leaky raw meat packages lying around that contaminate other things. If you have hot leftovers, let them cool, and store them in a cold place as quickly as possible. If prepared food has sat out in the sun for more than an hour, toss it. Do not leave foodstuffs out. Not only do you risk contamination but you can also attract animals to your site. This book includes recipes for both grilling on a wire g﻿﻿rate/grill as well as cooking on a stick or on a spit over an open fire. 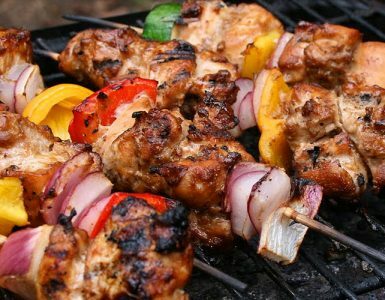 You will need skewers for grilling on a wire rack or grill. Alternatively, you will need to find sticks out in the wild for cooking over the open fire. When looking for your campfire stick, make sure it is long enough for you to hold over a fire without your hand having to be too close to the fire. Also, make sure the stick is nice and sturdy. The last thing you want is your tasty kebob landing in the fire a minute before it should have been landing in your mouth. First, you need to figure out how wide your fire pit is so that you can find a stick that will fit across and hold. Secondly you want to find a stick that has branches halfway down the center so that you can more easily secure your meat. You also need two additional, y-shaped sticks to balance your spit stick on. Make sure your sticks are high enough that the meat won’t burn in the fire. So part of the fun of cooking in the great outdoors is getting inventive. If you’re a frequent camper, then you’ve definitely had to fashion cutlery or utensils out of some very strange things at one point or another. Instead of having your bread squished up among all the other things you’re taking with you camping, keep it in a large, clean, tin can. Open it up at the site and enjoy non-squished-bread sandwiches. You can use any recipe you like for the baking of the bread. Freeze your water supply in large containers that you can place inside your cooler. They will keep the cooler cold and can be used for drinking water later. As an alternative to bread, take tortilla flour wraps. They take up less space than bread and can be used to make wraps, thin pizzas, and can even be crisped up for some chip-like action with salsa. Take salsa! Salsa is so versatile and will bring a new layer of flavor to your camping meals. It can be used in a ton of ways including as a dip, pasta sauce, in a stew, on tacos, on hot dogs – the choices are endless. Cooking meats and veggies with your basic salt and black pepper is alright if you’re camping for just a day or two, but if you plan on trying out the recipes in this book, you will want to take along some other spices. A great way to make your spices portable is to store small amounts in Tic-Tac boxes. If you live somewhere where you can get some birch bark, grab some of that easy-burning fuel, bag it, and take it with you for starting campfires in a flash. 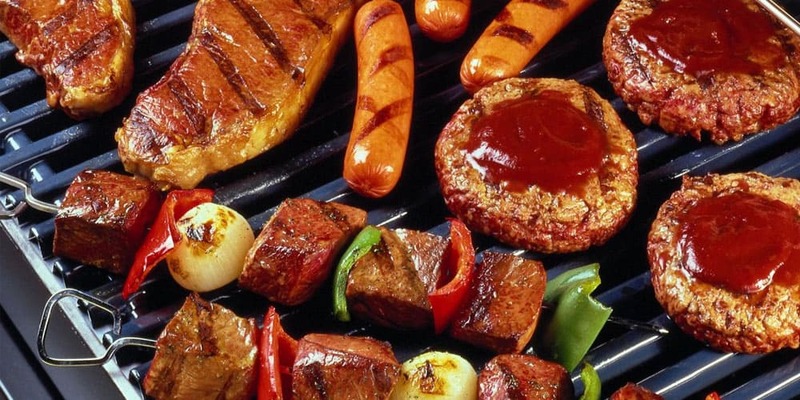 You can make a portable grill with an aluminum tray filled with hot coals with a rack placed on top. When cooking burgers over a fire, place an ice cube on each burger and you will avoid drying out the inside of the burger.